Though they're graceful in the sea, penguins aren't exactly known for being deft on land. To learn more about how their awkward gait impacts their chances for survival, a team of scientists had penguins waddle on a treadmill, The Guardian reports. The study, recently published in the journal PLOS ONE, found that fatter king penguins were more unstable than their thinner peers, making them more likely to fall over when evading predators. The heftier birds do have an advantage when it comes to breeding, as they're more likely to survive a long fast when caring for their eggs. 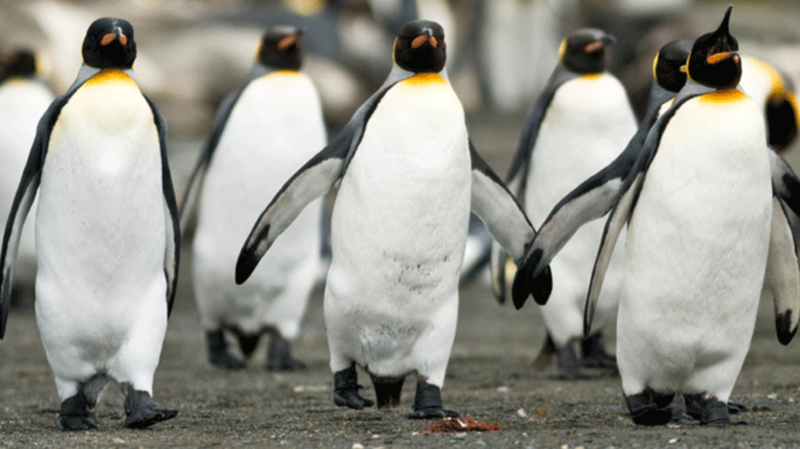 To gather their data, the research team led by Astrid Willener of the University of London traveled to Antarctica and captured 10 male king penguins who were in courtship mode. It's during this period that male penguins are at their heaviest, as they'll need the extra fat reserves when waiting for their eggs to hatch. To observe their waddle, the scientists placed the subjects on treadmills moving at just under .9 miles per hour both before and after two weeks of fasting. While the gait of the penguins remained pretty much the same across all weight levels, they were shown to be more stable on the treadmill following a diet. You can check out a sped-up clip of the footage in the video below. They aren't currently under threat, but king penguins are especially vulnerable to the effects of climate change. A 2007 study published in the Proceedings of the National Academy of Sciences [PDF] looked at a king penguin colony over the course of nine years, and found that the birds did not breed as successfully in the years when sea temperatures were the highest. Willener and her team hope that their new findings can be used to better understand the penguins and protect them in the future.